500 Piece Mechanics Tool Set. View my other items for more Craftsman tool deals! Load Up on All the Tools You Need to Get the Job Done With This 500-piece Mechanics Tool Set. When it comes to tool sets, you need a set of reliable and durable tools, this 500-piece Mechanics Tool Set will meet those requirements. Equipped with 307 regular and deep length sockets in the 3 major drive sizes, consisting of 6-point, 8-point and 12-point serrations. Specialty sockets include inch and metric hex bit sockets, spark plug sockets, screwdrive and Torx® bit sockets. Use these sockets on the 84 tooth thin-profile ratchets which give you additional access when needed due to the thin head design and low swing arc. 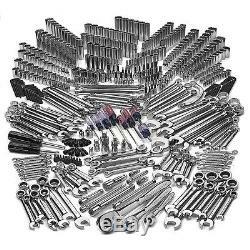 To round this set out you will find 103 various wrenches from the long pattern and stubby full polish combination wrenches to the fast reversible ratcheting wrenches. Also included are full polish flare nut, box end, tappet and ignition wrenches. 84 Tooth Ful Polish Thin Profile Ratchets. 103 - Full Polish Wrenches. Combination, Stubby Combination, Reversible Ratcheting, Box End, Flare Nut, Tappet, Ignition, Obstruction. The item "New Craftsman 500 Piece Mechanics Tool Set SAE metric 311 413" is in sale since Friday, January 27, 2017. This item is in the category "Home & Garden\Tools & Workshop Equipment\Hand Tools\Hand Tool Sets". The seller is "craftsmantools" and is located in Edmond, Oklahoma. This item can be shipped to United States.